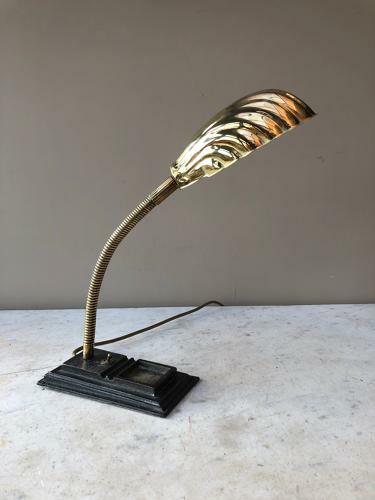 Lovely condition 1920s Brass Scallop Shell Desk Lamp with coiled moveable stem & iron base housing the on/off switch and handy pin tray. PAT Tested, Fully Working and Plug Attached to plug in a go. Last two photographs are plugged in my work shed and you can see it is working. The measurements are of the lamp in the first photograph but obviosly vary however the lamp is positioned.